Introduced at about the same time as Ultramarine, Cobalt Aluminate is a synthetic inorganic pigment. It is a more greenish blue, with a heavier, more mineral appearance when seen as dry pigment. The hues formed from it are correspondingly heavier and greyer. 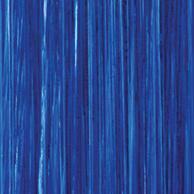 But it has a certain shade which the less expensive ultramarine cannot quite match. The paint film when cured is quite soft.